I don’t believe I am alone when I admit that I don’t often make a recipe as it is written. I use the recipe as a guide, and substitute flavours here and there. Sometimes with success and other times not so but during the process I learn a little more about what works and what doesn’t. And so if I had been making this recipe – it may not have been such a wonderful ending to our dinner. We had invited guests to eat with us, and I was in charge of the main course (a chorizo lentil pumpkin salad), my right-hand kitchen man “The Anster” offered to make dessert. Let me be honest – The Anster is a very good cook except when it comes to muffins but he excels at roasts and savoury dishes, and he makes perfect bread. It is an unusual situation where he makes dessert and I make the main as desserts are my forte. Anyway The Anster had browsed through my recipe book mountain and declared he liked the look of Jo Seagar’s It’s Easier than you Think recipe book that I had recently acquired. That gave me all the excuse I needed to buy Jo Seagar’s new book Italia which I had been salivating over . Our combined ancestry is Dutch, German, Scottish, English & Irish with a dash of French and a smattering of Welsh. I am sure there are other herbs and spices that make up the brew but they are the main flavours I am aware of. However our taste buds are pure Italian and I knew that this book would get a real working over in our kitchen. Sure enough the book was not much more than a few days old before it was introduced to the family. I had briefly scanned the recipes, spending 80% of the time in the desserts and baking section as I do. I mentally earmarked Apple & Lemon Torta as the first recipe I would try – but The Anster pipped me on that one. 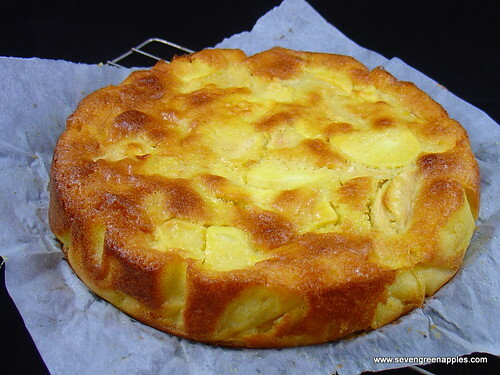 The cake is typically Italian and has very simple ingredients – eggs, sugar, flour, butter. I was further impressed that the variety of apple specified – Golden Delicious. What a pity we didn’t have any of those just right now. So our apple cake was made with the usual kind of apple in our vegetable box – Mixers (miscellaneous mixed apples). We had a near miss with the instructions – grated rind of a lemon to me seems quite clear that it is to be grated. Not so for The Anster and our cake had zested lemon strips but appeared not to suffer unduly. This cake serves 8 – we served it to 4 adults, 4 semi-adults (15,14 and 13×2) and two not-quite-adults (12 and 11) and we could have dispatched two cakes. There were squabbles for the last crumbs – I’ve not seen a cake disappear so fast and it wasn’t even iced! So if you have Italia: Simple Recipes from the Italian Cook School then turn to page 317 and start baking now. If you don’t then it is worth buying this book for this recipe alone. When I find superb recipe that doesn’t need playing around with but is just perfect as it is then I like to share such recipes with anyone and everyone giving full credit to the cook, chef, recipe creator or food writer – whichever moniker they wish to wear. People often comment that I am a great cook, but I respond that I am really good at finding really good recipes, so if I can share that recipe then they can be thought of as great cooks also. You can visit Jo Seagar’s website and try out some of her other recipes. I have no affiliation with Jo Seagar or the Seagars at Oxford, I simply admire her philosophy of maximum effect for minimum effort and have tried many of her recipes over the years with great success. This entry was posted in Baking, Book Review, Cake, Dessert, Recipe Review and tagged baking, cake, cookbook review, Golden Delicious, Jo Seagar, recipe review, torta by Jo Dohrman. Bookmark the permalink.